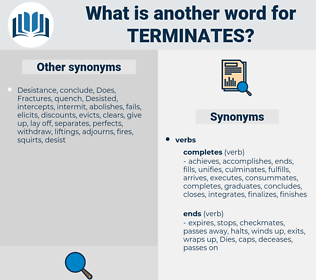 What is another word for terminates? engagements, timetables, deadlines, lapses, dates, concludes. 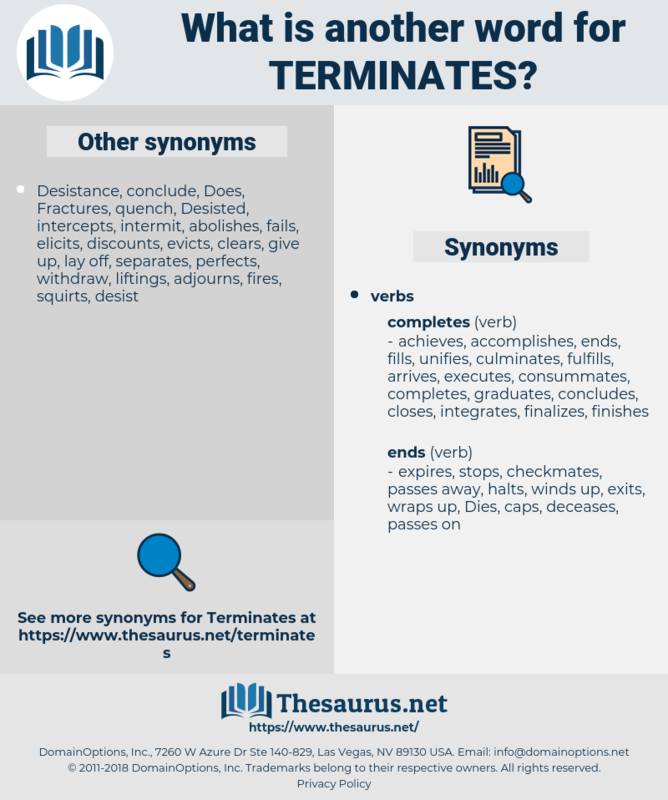 ceases, vacates, withdraws, culminates, stops, cessation, retires, departs, rescinds, separates, finalizes, expires, exits, extinguishes, Leaves, quits, reverses, fails, ieaves, explores, skips, forbids, turns, loses, continues, Rests, Comes, flees, latches, lasts, shifts, draws, locks, leads, crashes, passes, closes, runs, logs, keeps, gets, finishes. This island is of moderate height, and well covered with wood; we passed on the south side; its general direction is about east - north - east and west - south - west, and in that direction is about seven leagues in length: it appeared to be of considerable breadth at its eastern end, and narrow towards its western, where it terminates in a narrow point, off which lies a small woody island, with a narrow passage between that and the main island, to which it appears connected by a reef. With him the neolithic epoch terminates.